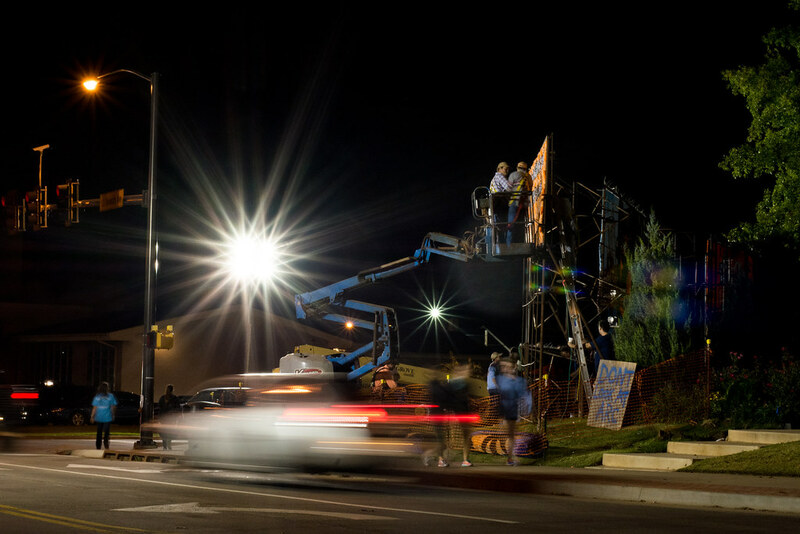 Each year the fraternities and sororities at Oklahoma State University construct elaborate decorations for our annual homecoming celebration, and on Friday night before the big football game everyone in town heads to campus for an event called Walkaround. It really is a sight to behold, with fifty thousand people milling around, live music playing, vendors selling all sorts of food, games for the kids, and of course the massive decorations–many of which feature animatronic moving parts. The Alumni Association bills the weekend as “America’s Greatest Homecoming Celebration,” and while I can’t verify that claim with authority, I can say that it sure is a cool experience. This year I went down on Thursday night as the final preparations were being made, with the intention of getting a few pictures as the decorations (or “decks,”) were being assembled. I had hoped to get a shot of someone welding so I could get spark trails, but it was not meant to be–the welding was all finished at this point. Instead I captured this shot and a few others like it, which were intended to show some of the preparations as well as the hustle and bustle of the evening’s activity. I don’t know that this picture does a good job, especially since you can’t really see what the two guys on the lift are actually doing, but I was pleased that I was able to capture the light trails from the passing car as well as a general sense of what it’s like on a nighttime construction job. I like the picture especially the lights. How did you add the commentary? If you’re too close to the light source you won’t get the star patterns, Linda. Try shooting something a bit farther away like a street light at dusk, or the sun peeking out from behind a building. If you’re shooting in dark conditions you need to use a tripod, but as long as you’ve got the aperture stopped down to f/16 or f/22 (or even f/8) it should work. Let me know how it goes though! I have not posted yet except some to FB (you can see some there). I am working on a webpage. I just shot the “star” streetlight last night to practice. It is not an extraordinary shot. I am teaching myself and trying to pose challenges so I learn different techniques – shooting with just one lense for a month, bokeh, and stars. I am happy to have this art form with all it’s challenges! Happy I found your webpage. I know what you mean about trying to get the hang of different techniques. If you ever do post some of your photos online (Flickr, 500px, etc.) let me know!